Walker Sands, an integrated PR and digital marketing agency for B2B technology and professional services companies, has elevated three senior account directors to the role of partner. 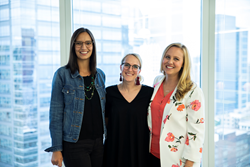 Chicago PR leaders Allison Ward and Erin Jordan, along with Seattle team lead Annie Gudorf, were named to the role effective this month. Annie Gudorf joined Walker Sands in 2012 and worked her way up through media relations and account management roles before heading to Seattle to expand Walker Sands’ west coast presence. With client experience that includes CompTIA and Nintex, Annie and her team are responsible for some of the agency’s best campaigns – work that regularly receives recognition from the Public Relations Society of America, among others. Erin Jordan joined the firm in 2012 and has grown to lead the agency’s retail technology practice. In addition to her experience with brands including CloudCraze and Globant, Erin leads Walker Sands’ annual Future of Retail research, now in its fifth year. Erin is a board member at PRC Next, a small group of rising leaders within the PR Council. Allison Ward joined Walker Sands in 2013 as an account manager after prior experience in both agency and in-house PR roles. As a senior account director managing a book of business across FinTech, electronics and other areas, Allison’s client experience includes work with Newark element14, Worldpay and Billtrust. She also serves as the PR partner for the Illinois Technology Association’s Women Influence Chicago initiative. Earlier this year, Walker Sands was named a top 5 tech agency in the U.S. and the best firm to work for in America (under 120 employees) by the Holmes Report. As Walker Sands continues to grow, the firm has invested in several key hires in Web, content, video, account management and other areas. For a full list of open positions at Walker Sands, visit http://careers.walkersands.com/.